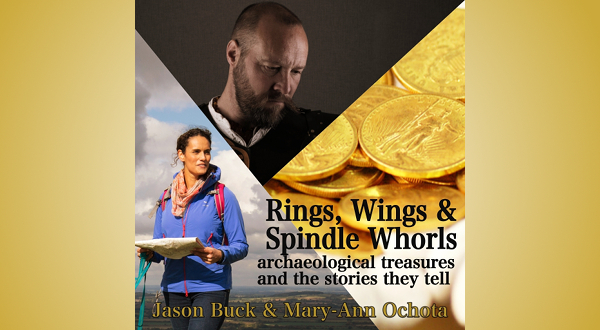 Join TV presenter and archaeologist Mary-Ann Ochota and storyteller Jason Buck on a unique journey through Britain’s history, telling stories inspired by historical artefacts from the Iron Age to World War 2. This event is brought to you by Heritage Lincolnshire's Layers of History project and we will be celebrating a successful first year with a birthday cake! Weaving fact, fiction and myth together, Mary-Ann and Jason will reveal the intriguing, exciting and occasionally bizarre stories behind archaeological treasures from Lincolnshire and beyond, both famous and forgotten. Get ready for an evening of warriors and witches, love and loss, treasures hidden from the Nazis, Viking gods in Saltfleeby, and a hungry cow in Navenby. Time: Doors open at 6:30pm and the performance starts at 7:00pm. It will be a two-hour performance with an intermission and there will be a bar. Venue: The Blue Room Lincoln. Tickets: £13.50 available from our online shop. MARY-ANN OCHOTA is familiar face on archaeology shows including Time Team, Ancient Impossible, and Britain Afloat. She’s written two popular archaeology books, Hidden Histories: A Spotter’s Guide to the British Landscape, and Britain’s Secret Treasures, from which the artefacts in this show are drawn. JASON BUCK is an award-winning storyteller with a particular flair for historical tales. He’s been a performer most of his adult life, bringing passion, presence and wit to stories both true and almost true. He’s published three collections of stories, including Stories from the Woods and Wild Places.